Back in September, I posted about the chopped salad that was my top choice for my birthday dinner. Since then, I’ve been overwhelmed at the amount of attention that post got! I guess the internet was hungry for the funky-but-delicious combo of smoked salmon, dried sweet corn, cranberries, and arugula (among other ingredients) topped with a creamy pesto dressing. 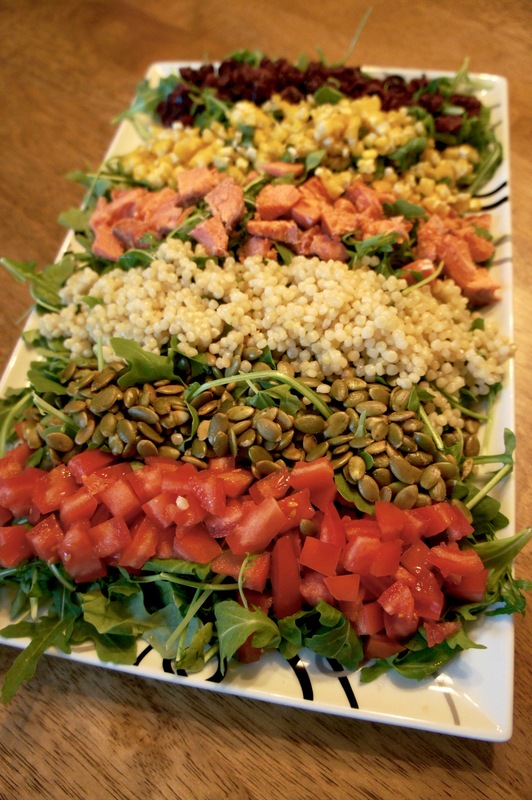 Writing about–and eating–the Stetson Chopped Salad got me thinking of other variations on the theme of salad ingredients layered neatly in rows. I mean, really, you can’t go wrong with a chopped, layered salad. It’s just so dang appealing, with its colorfulness, its order, and its symmetry. 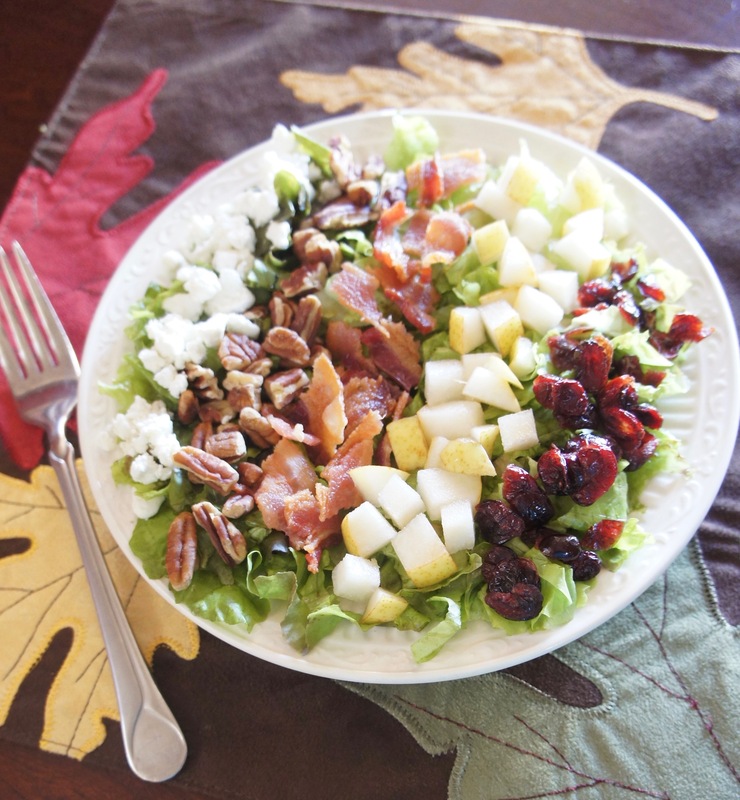 This Harvest Chopped Salad featuring apples, pears, cranberries, pecans, bacon, and blue or goat cheese is the product of these recent salad daydreams. It couldn’t have come at a better time, either. Not long ago, I started volunteering on a monthly basis as a cooking demonstrator at my local Natural Grocers. It’s a fun volunteer activity, but it’s tougher than you might think coming up with recipes that are 1.) gluten-free (Natural Grocers keeps a gluten-free kitchen), and 2.) conducive to demonstration. When you watch the Food Network, you don’t really notice that TV allows for time-lapsing cooking, or simply producing a finished version of something that took who-knows-how-long to cook or bake. In the real world, it’s not that easy. Like, if I’m demo’ing a recipe with roasted vegetables, uhhhh, what do I talk to my audience about for 45 minutes while the oven does its job? So for the purposes of my October demonstration, the Harvest Chopped Salad is a saving grace. And maybe it will be for you, too, some autumn weeknight. There may be quite a bit of slicin’ and dicin’, but this recipe requires no lengthy cook time and can get dining-ready in no more than 30 minutes. If you live in the Phoenix area, join me for my demo (and samples!) of this yummy fall main dish this Thursday, October 19th, at 6:30 at the Natural Grocers at 2151 E. Baseline Rd. in Gilbert. 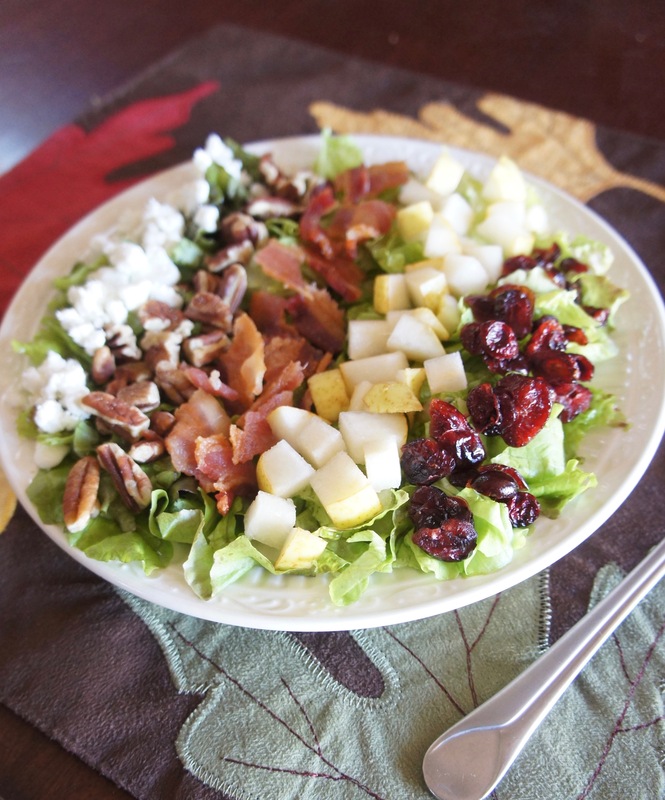 A hearty fall salad that's as tasty as it is pretty! On a large platter or five individual plates, spread romaine in a single layer. Cover with layered rows of bacon, pecans, crumbled cheese, diced apple, diced pear, and dried cranberries. Serve with purchased poppyseed dressing drizzled on top or on the side. 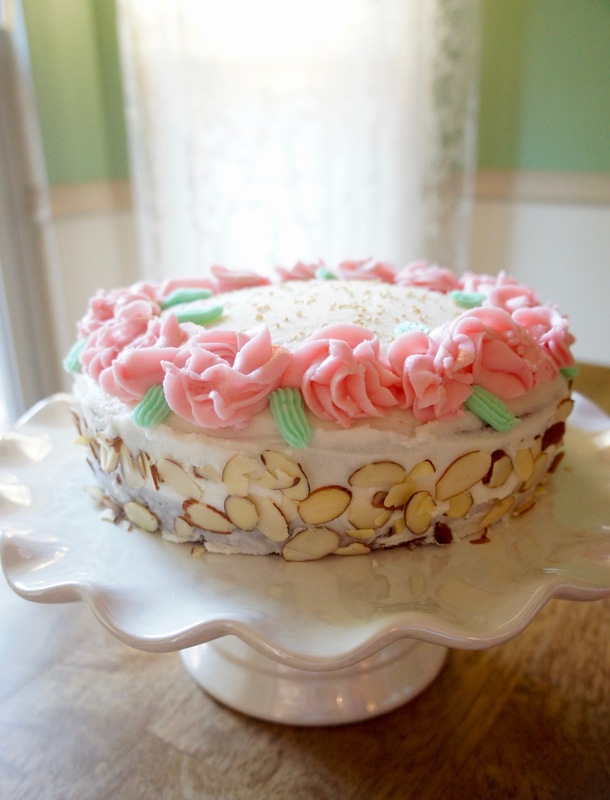 A Love Letter to Food Original Recipe, loosely based on this recipe from Iowa Girl Eats. If you follow A Love Letter to Food on Facebook, you may have seen this picture before. (And if you haven’t liked my Facebook page yet, I’d be most honored if you would!) A few days ago was my birthday, and as an avid–or obsessive, depending on how you look at it–home cook, I typically would rather make something truly spectacular at home for my birthday dinner than go out. This Stetson Chopped Salad was THE ONE dinner I knew would be birthday-worthy this year. What is a Stetson Chopped Salad? (And who in their right mind chooses a salad for their birthday dinner?) Well, in the Phoenix area, the Stetson is a local food celebrity. It’s pretty impressive for any salad to attain celebrity status, but somehow, sometimes, it happens. After all, you’ve heard of Cobb, Waldorf, and Wedge. 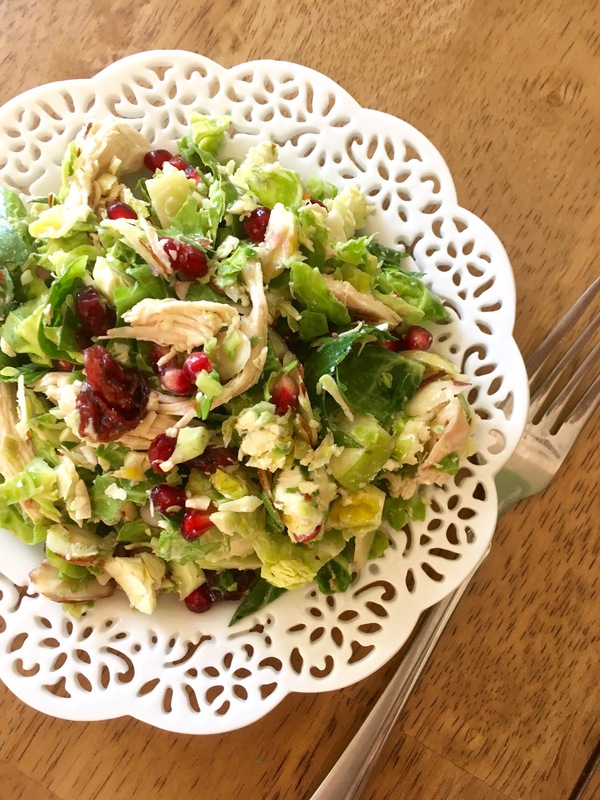 These famous salads are like the old Hollywood starlets of healthy American cuisine. Classic, standard, glam. The Stetson Chopped Salad, on the other hand, is like the up-and-coming Western girl hitting the big time. Its humble origin lies with Cowboy Ciao, a restaurant located, appropriately, on Stetson Drive in Scottsdale. A few years ago, some friends had us over for dinner and served a homemade version of the Stetson. It was an edible work of art, with a taste no less extraordinary than the presentation. But we definitely found ourselves in “why-do-these-flavors-go-together-this-makes-no-sense” territory. Who the heck thought of putting sweet (dried currants) with savory (corn and tomatoes) with smoked salmon and a creamy basil dressing? Even when my husband and I eventually ate at Cowboy Ciao and of course ordered the “real” restaurant version, it didn’t quite compare to the one our friend had made. (She is a trained chef, so that probably helped.) With this memory in mind, I made my own birthday version, and it was indeed an awesome mix of flavors, textures, and visual appeal. Definitely a salad worth choosing for a special occasion. Oh, and the other reason I chose salad for my birthday? Cause I knew this was coming afterward! You'll be amazed at how this unusual combination of flavors makes for a totally crave-worthy salad! Spread arugula leaves evenly on a large, flat platter. 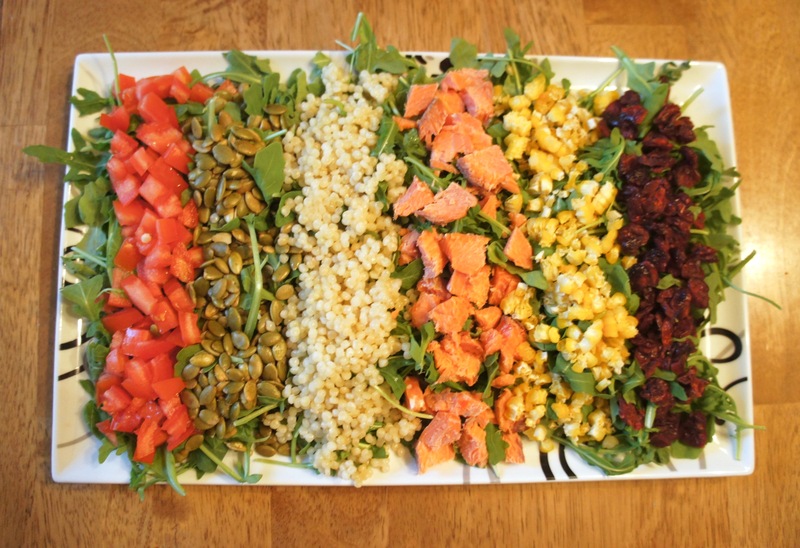 Cover with layered rows of couscous, salmon, pepitas, sweet corn, cranberries, and tomatoes. Combine all dressing ingredients in a measuring cup and mix with an immersion blender until smooth. Mix salad tableside, if desired, and serve with dressing on the side. Based on this recipe from Key Ingredient.